The print is a two plate color intaglio. It includes line etching, aquatint and a photo-transfer technique for the teeth image in the background. I have worked with the theme of dependent production in the past. Therefore, when I read the Hearst poem the subject matter appealed to me. I liked the straightforward and humorous demeanor of the poem. It walks the line between limerick and art. I think the print has a similar feel, like a children's book illustration of a rather gruesome fact. 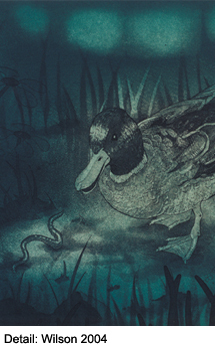 I wanted the print to look like a nice duck picture but have the mouth and teeth subtly appear in the background almost unnoticed. The mouth comes from a photo I took of my own. I rendered the duck and all other aspects by hand. The aesthetic of the print is similar to some of my new drawings that I am currently showing in Nashville.